Spar Citylift Girona (LFB) signed 27-year old Mozambique ex-international power forward Leia Dongue (185-91). She started the season at Cegledi EKK in Hungarian A Division. In 7 games she had very impressive stats: 15.4ppg, 6.6rpg, 1.0apg and 1.0spg this season. Dongue also played 6 games in Eurocup where she recorded also remarkable stats: 15.7ppg, 5.8rpg and 1.2spg. The most of last season she spent at Lointek Gernika Bizkaia. In 13 games she averaged 11.4ppg and 4.9rpg. The other team Dongue played shortly was 1 De Agosto in Angolan league. The list of the past achievements is quite long as among others her team won African Champions Cup in 2012, 2015 and 2017. Dongue was also voted Afrobasket.com All-African Champions Cup 1st Team in 2013, 2014, 2016 and 2017. She represented Mozambique at the World Championships for Women in Turkey five years ago. Her stats at that event were 3 games: 15.0ppg, 11.7rpg, FGP: 35.6%, 3PT: 50.0%, FT: 63.6%. Dongue has played also professionally in Mozambique (Desportivo Maputo), Angola (Primero) and Spain (Al-Qazeres). She could be described: She is not only a dominant force in the paint, but can hit the basket from outside too, almost ready to play stably the 4 position at any level. Kenya Ports Authority found the going very tough against hosts Ferroviario, who outclassed them 73-40 to deny them a semi final slot at this year's Fiba Africa women's Champions Cup here at the Maxaquene indoor courts on Friday night. The Kenyan team, who had vowed to tame the hosts in front of their fans, did not know that their opponents had a different plan for them as captain Ingvild Mucauro (178-F-92) and her two American team mates, Cierra Robertson-Warren (193-C-91, college: San Diego St., agency: Two Points) and Carmen Virginia Tyson-Thomas, tormented the dockers defence at will. The hosts took a huge 17-2 first quarter lead, which they increased to 38-11 at the break. A strong third quarter, which saw KPA leading goal scorer Jamila Zama, hardworking point guard Debra Atieno and Brigid Nanzala (83) combine for a 22-20 score, did little to help KPA, who only scored seven points against 15 for their opponents in the fourth quarter to stroll to an easy win. Adriana Kosa top scored for Ferroviario with a game high 15 points, while Cierra Robertson-Warren had 10 in this match, which saw Zama limited to only 10 points for KPA, her lowest at this championships, while Nanzala had eight. "They ambushed us in the first quarter when they outscored us and coupled with the partisan crowed rooting for them, it made it impossible for us to recover," KPA coach Anthony Ojukwu said after the match. KPA are due to play Forces Armed Police (F.A.P) from Cameroun in a classification match on Saturday to determine teams ranking from position five to eight. In other quarter final matches, F.A.P gave tournament favourites First Bank from Nigeria a scare, before narrowly losing 66-69 in a match which went to the wire, with the star-studded Nigerians winning it on the buzzer. The other quarter final matches saw Inter Club of Angola easily dismiss MB2All from Madagascar 84-46, while DR Congo's Victoria Club shocked compatriots I.N.S.S 78-43. Inter Club are due to take on Victoria Club in the first semi final from 4.45pm on Saturday, before Ferroviario square it out with First Bank in the second semi final from 7pm. The week-long championships, which attracted ten teams, concludes Sunday with the third place play-off and the final. Cegledi EKK (A Division) strengthened their roster with addition of 27-year old Mozambique international power forward Leia Dongue (185-91). She played most recently at Lointek Gernika Bizkaia in Spanish LFB league. In 13 games she recorded 11.4ppg and 4.9rpg last season. Dongue also played for 1 De Agosto in Angolan league. Among other achievements her team won African Champions Cup in 2012, 2015 and 2017. 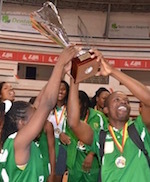 Dongue received also Afrobasket.com All-African Champions Cup 1st Team award in 2013, 2014, 2016 and 2017. She represented Mozambique at the World Championships for Women in Turkey four years ago. Her stats at that event were 3 games: 15.0ppg, 11.7rpg, FGP: 35.6%, 3PT: 50.0%, FT: 63.6%. Dongue has played also professionally in Mozambique (Desportivo Maputo) and Angola (Primero). The scouts decsribe her following way: She is not only a dominant force in the paint, but can hit the basket from outside too, almost ready to play stably the 4 position at any level.